USA 2 Canada 0. Goals: Heath 2, Morgan 88. Their spots in next year's Women's World Cup already secured, the USA and rival Canada slugged it out for the Concacaf Women's Championship in rainy North Texas on Wednesday night. The USA won its sixth regional championship with a 2-0 victory but not before it endured a pounding from the Canadians, who were issued four yellow cards and could have been assessed more. 1. USA doesn't mess around. Early goals put the USA in commanding positions in all five games at the Concacaf Women's Championship. It took all of 110 seconds for the Americans get on the board against Canada. And like so often, they made their opponent pay for not playing out of danger. Lindsey Horan beat two defenders on the left side and played a curling ball that center back Shelina Zadorsky cleared right to Rose Lavelle just outside the area. The midfielder curled her left-footed shot inside the far post for the early lead. MEX (6-0): Megan Rapinoe 3rd minute. PAN (5-0): Sam Mewis 5th minute. TRI (7-0): Alex Morgan 9th minute. JAM (6-0): Tobin Heath 2nd minute. CAN (2-0): Rose Lavelle 2nd minute. 2. Horan for Ballon d'Or? 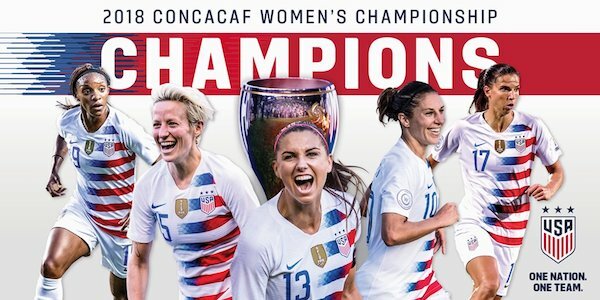 Since the late summer, the USA has gone from strength to strength, winning the Tournament of Nations in which it faced Japan, Australia and Brazil, all teams that will be at the 2019 Women's World Cup, and sweeping all five games in Concacaf qualifying to improve its 2018 record to 16-0-2. No player has been bigger for the USA than Horan, who also set up Alex Morgan for the second goal in the 88th minute with a delicate pass to the near post. Morgan won the Golden Boot as the tournament's high scorer with seven goals and Julie Ertz won the Golden Ball as the tournament's best player but Horan was the difference maker for the USA throughout the tournament, beginning with the opening game against Mexico when she set up the first two goals. Horan, the 2018 NWSL MVP, is one of two Americans nominated for the new Women's Ballon d'Or. She might not yet have the name recognition of Brazilian Marta or German Dzsenifer Marozsan or even Megan Rapinoe, the other American on the 15-year short list, but no other player has had as good a year as the 24-year-old Horan, who skipped college to sign with Paris St. Germain and returned home in 2016 to join the Portland Thorns. 3. Yes, Canada, there is a gap. The gap between the USA and its first four opponents at the Concacaf Women's Championship was obvious. It was never tested en route to four easy wins: 6-0, 5-0, 7-0 and 6-0. The final against Canada was a little different. The final was a one-goal game until the 88th minute when Morgan scored a goal that should have been called off for offside. Canada's physical style took its toll on the USA, which struggled to put the game away. But Canada finished with as many yellow cards as it did shots with four each. Asked what it would take to close the gap between the USA and Canada in women's soccer, Canada's Danish coach, Kenneth Heiner-Moller, insisted there's no gap. The record doesn't back that up. The win extended the USA's unbeaten streak against Canada to 34 games, dating back to 2001 when the USA took a second team to the Algarve Cup and lost to Canada, 3-0. Trivia. Canada became the eighth World Cup-bound team the USA has beaten in 2018 along with Germany, England, China, Japan, Brazil, Chile and Jamaica, which became the first Caribbean team to ever qualify when it won the third-place game in a shootout over Panama. USA -- Naeher, O’Hara, Dahlkemper, Sauerbrunn, Dunn (Short 90+3), Ertz, Horan, Lavelle (Lloyd 88), Heath (Pugh 90+2), Morgan, Rapinoe. Canada -- Labbe, Lawrence, Buchanan, Zadorsky, Chapman (Matheson 76), Quinn, Fleming, Schmidt, Sinclair, Prince (Leon 46), Beckie (Huitema 88). 4 comments about "USA-Canada Concacaf Women's Championship: USA overcomes pounding to win regional title". schultz rockne, October 18, 2018 at 1:26 a.m.
Bob Ashpole, October 18, 2018 at 9:22 a.m. I was disappointed in the officials. Too many of the calls and no calls were inexplicable. I am relieved no one was injured by all the foul tackles. I am also amazed at the discipline shown by the US players. I am not sure I could have kept my temper in check after getting repeatedly fouled like that. In my mind the last goal verified that the problem was poor officiating rather than biased. I hope that the officials learn from the experience because in the long run, we need better officiating. R2 Dad replied, October 18, 2018 at 12:28 p.m.
Yup, the USWNT was CONCACAF'd. Tobin Heath got punted around the park in the first half, but the Mexican official didn't want to call those fouls. So the match started getting chippy, all on account of the center ref's inability to just call the fouls. There was a very obvious moment in the match when Heath just said, Fine, I guess we can't play soccer. Rapinoe started embellishing in order to get the fouls called. Roughing-up the USWNT was very obviously the strategy of the Canadian coach, Kenneth Heiner-Moller. He should be criticized for encouraging it. Why does the CONCACAF conference lag behind UEFA? Because nations in this conference have decided it's better to blame the refs and blame the fields than actually just play the game better. When you have consistent officiating and decent fields at every country, all that's left to complain about is the poor soccer (and by extension the coach/players/FA). CONCACAF encorages uneven officiating and crappy fields, to allow the countries playing rugby to have a chance of winning. It's always been so. James Madison, October 24, 2018 at 8:43 p.m. If necessary, the officials should be brought in from other federations. That aside, my persistent lament is the absence of attempts by SA to rate USA players.